Audemars Piguet made headlines a few months back when they announced that 2019 would be the last year they will attend the Salon International de la Haute Horlogerie (SIHH). However, in the meantime, the famed Swiss watch manufacture is sticking to tradition by teasing some new watches just ahead of the official start of the event. 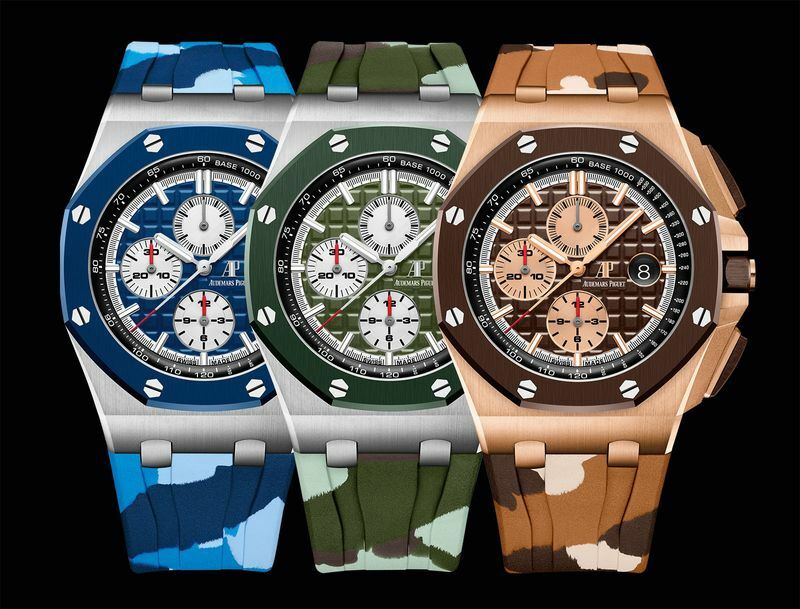 Let’s jump right in and take a look at the three new Audemars Piguet Royal Oak Offshore Chronograph Camouflage watches that will be released at SIHH 2019. Audemars Piguet will be releasing 3 new Royal Oak Offshore Chronograph Camouflage watches at SIHH 2019 (Image Credit: Audemars Piguet). 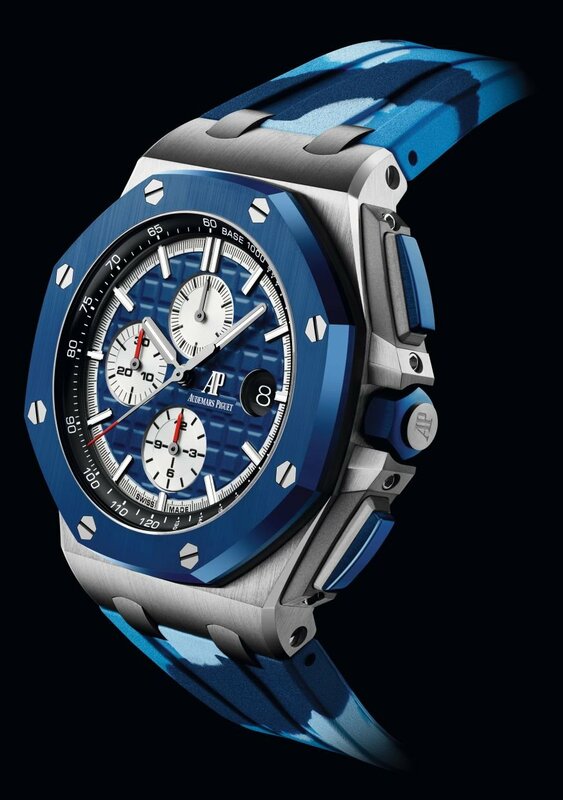 The stainless steel with blue ceramic accents version of the new Royal Oak Offshore Chronograph Camouflage (Image Credit: Audemars Piguet). The Royal Oak Offshore Chronograph Camouflage watches sport 44 mm cases, complete with AP’s signature, octagonal bezel with exposed screws, and their “Méga-Tapisserie” hobnail-patterned dial. The bezel is fashioned from a high-tech colored ceramic material, which is also used for the chronograph pushers and the screw-down winding crown. Ceramic has been a favorite material within the luxury watch space for a few years now, prized for its resistance to scratching, fading, and extreme temperatures. Making colored ceramic is especially difficult, requiring long and complex manufacturing processes. Within this new selection of Royal Oak Offshore Chronograph Camouflage watches, there are two stainless steel models available – one with blue details (ref. 26400SO.OO.A035CA.01) and one with olive green accents (ref. 26400SO.OO.A055CA.01). The colorful dials feature sub-registers at 6, 9, and 12 o’clock, accompanied by a date window at the 3 o’clock location. The camouflage component comes in the form of rubber straps in matching blue or green camouflage color schemes. However, for those days that you want to wear something a bit less multicolored, each watch comes with an alternate solid-colored rubber strap too. 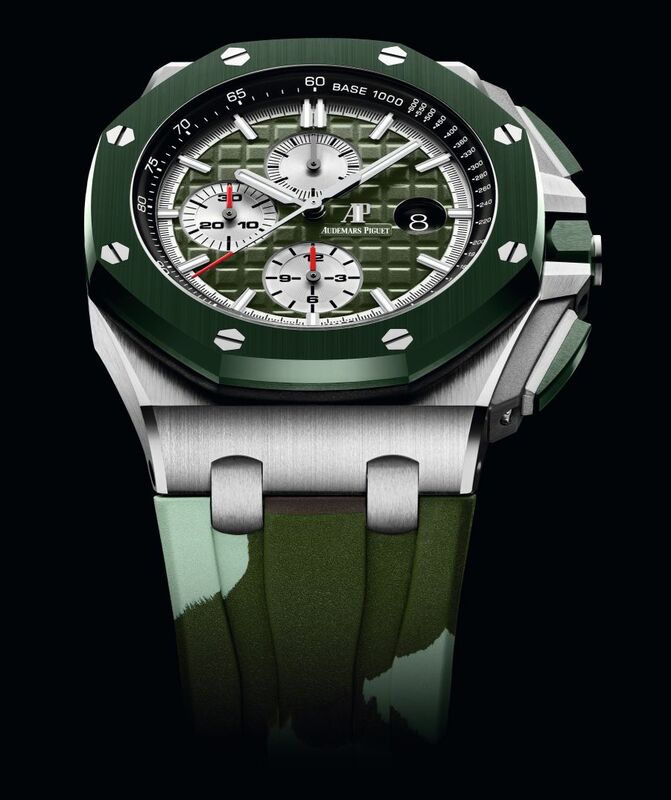 The stainless steel with green ceramic accents version of the new Royal Oak Offshore Chronograph Camouflage (Image Credit: Audemars Piguet). 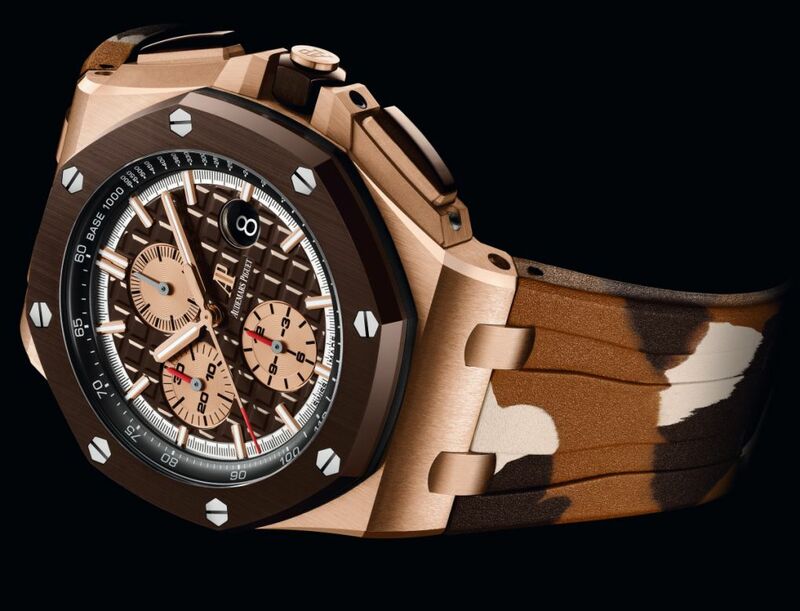 The rose gold with brown ceramic accents version of the new Royal Oak Offshore Chronograph Camouflage (Image Credit: Audemars Piguet). In addition to the two stainless steel models, Audemars Piguet will launch a pink gold version (ref. 26401RO.OO.A087CA.01) of the new Royal Oak Offshore Chronograph Camouflage. Sitting atop the 18k pink gold case is a brown ceramic bezel – a first for Audemars Piguet. Carrying on the earthy hues is the brown-colored Méga-Tapisserie dial, which houses pink gold chronograph registers, pink gold applied hour-markers, and pink gold Royal Oak hands. Like all Royal Oak Offshore Chronograph models, this new pink gold camouflage version includes a tachymeter scale along its inner bezel, which can be used in conjunction with the centrally mounted, chronograph seconds hand. 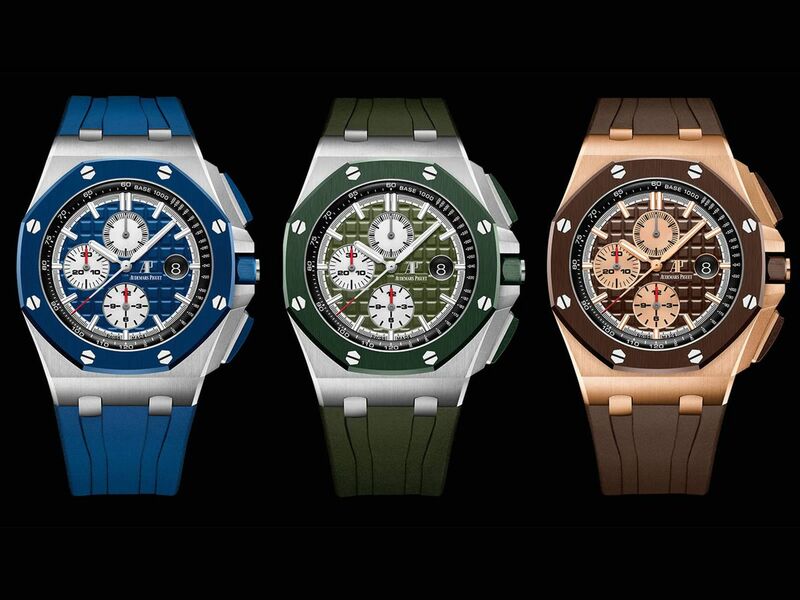 All of the new Royal Oak Offshore Chronograph Camouflage watches will come with additional solid-color straps (Image Credit: Audemars Piguet).